CYCLOIDEA (CYC)-like TCP genes are critical for flower developmental patterning. Exciting recent breakthroughs, including a study by Song et al. published in BMC Evolutionary Biology, demonstrate that CYC-like genes have also had an important role in the evolution of flower form. Across the flowering plants (the angiosperms), bilaterally symmetrical (zygomorphic) flowers are thought to have evolved many times independently from radially symmetrical (actinomorphic) ancestors. 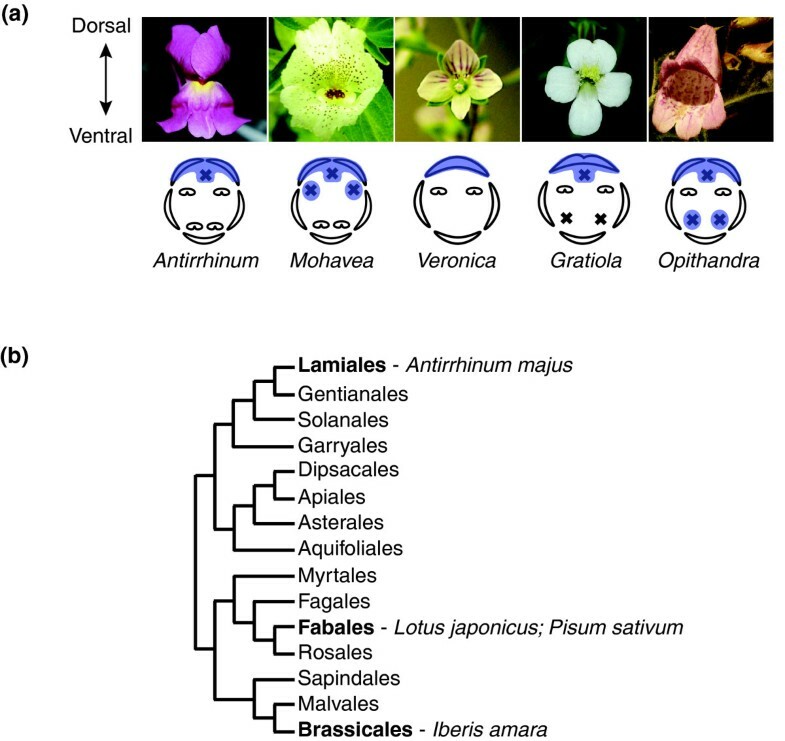 Transitions to bilateral flower symmetry have been associated with the evolution of specialized pollinators and have been crucial in the diversification of flowering plants. Zygomorphic flowers have dorsal (adaxial) organs that are morphologically different from ventral (abaxial) ones (Figure 1a). Asymmetry along the dorsoventral axis is most evident in the petal and stamen whorls. Bilaterally symmetrical corollas (petal whorls) help promote the approach of pollinators from one particular orientation. In addition, the dorsalmost and/or ventral stamens are often aborted, leaving only a rudimentary stamen (staminode; Figure 1a). This can facilitate access to the remaining stamens by pollinators or increase the specificity of pollen deposition during pollinator visits. Independent recruitment of CYC-like genes for the evolution of floral zygomorphy and stamen reduction. (a) Images and diagrams of flowers of several Lamiales lineages, illustrating the diversity in stamen reduction. Antirrhinum, Mohavea, Veronica and Gratiola are members of the Plantaginaceae; Opithandra is a member of the Gesneriaceae. Shading indicates the approximate expression of at least one CYC-like TCP homolog in each of these lineages; X indicates the presence of a staminode. In Veronica, Gratiola and Opithandra, at least one other close paralog of the CYC-like gene whose expression is illustrated has a highly divergent pattern of expression [2, 11]. In Mohavea and Opithandra, expression correlates with additional stamen reduction compared with Antirrhinum. In Veronica and Gratiola, there is no correlation between CYC-like gene expression and additional stamen reduction. In Veronica, staminodes are absent in the dorsal and ventral flower regions where stamen loss is inferred. (b) Three of many independent transitions from radial floral symmetry to bilateral symmetry across the core eudicot lineage are indicated in bold. Functional studies of A. majus , L. japonicus , P. sativum  and I. amara  have demonstrated that developmental genetic pathways using CYC-like TCP genes have been independently recruited to establish bilateral flower symmetry. The photograph of Opithandra in (a) isreproduced with permission from . Groundbreaking comparative studies over the past few years have demonstrated that CYCLOIDEA (CYC)-like genes, which belong to the class II TCP family of transcription factors, have been recruited multiple times to pattern dorsal flower identity in core eudicot lineages that have independently evolved zygomorphic flowers (reviewed in ; Figure 1b). Until recently, CYC-like genes had been mostly thought to be related to the control of dorsal and lateral floral organ development. However, in their recent BMC Evolutionary Biology article , Song et al. present compelling data implicating CYC-like genes in the abortion of ventral stamens. Their work contributes significantly to the growing body of evidence that changes in the expression and/or function of TCP genes have been a powerful tool, recruited multiple times, to generate novel floral morphologies. Class II TCP transcription factors have dramatic effects on cell proliferation and differentiation. Specific effects vary depending on the tissue in which the genes are acting. Not surprisingly, their activity is tightly controlled, both spatially and temporally, as subtle alterations in their regulation usually lead to noticeable phenotypic effects that are, in most cases, deleterious. However, some of these regulatory changes have been maintained during evolution, probably by natural selection, giving rise to adaptive novel traits such as corolla zygomorphy and stamen abortion (reviewed in [1, 3]). In Antirrhinum majus (snapdragon, family Plantaginaceae), CYC and its close paralog DICHOTOMA (DICH) are expressed early in the dorsal domain of the flower meristem, where they limit the rate of cell proliferation and primordium initiation. Later, they continue to be expressed in dorsal petals to control their size and shape and in the dorsalmost stamen primordium, where they cause abortion of this organ to form a staminode [4, 5] (Figure 1a). CYC-like genes have been recruited several times independently during angiosperm evolution to carry out this function (reviewed in ). A possible explanation for the repeated co-option of CYC-like genes comes from studies in Arabidopsis, a species with radially symmetrical flowers. The Arabidopsis CYC-like gene, like CYC in snapdragon, is expressed dorsally in floral meristems, even though the meristems are destined to form radially symmetrical flowers. This suggests that ancestral species with radially symmetrical flowers may have had CYC-like genes dorsally expressed in flower meristems. This incipient asymmetry could then have been recruited several times independently, by changes in timing of expression and/or interactions with target genes, to generate bilaterally symmetrical flowers (reviewed in ). Evidence for the independent recruitment of CYC-like genes for the development of floral zygomorphy comes largely from studies in the core eudicot lineages Fabales and Brassicales. Bilateral flower symmetry is a prominent condition within the pea family, Leguminoseae (Fabales, Figure 1b). In two emerging model legume species, Lotus japonicus and Pisum sativum, gene expression and functional analyses both implicate CYC-like genes in the control of bilateral flower symmetry. In these species, CYC-like gene expression is restricted to dorsal or dorsal plus lateral regions of developing flowers, similar to CYC expression in snapdragon [7, 8]. More compelling than the correlation between CYC-like gene expression and zygomorphy are the functional data that demonstrate a role for CYC-like genes during dorsal flower development. Specifically, ectopic or reduced expression of CYC-like genes in L. japonicus and P. sativum disrupts wild-type patterns of dorsoventral symmetry, resulting in dorsalized or ventralized flower phenotypes, respectively [7, 8]. Although bilateral flower symmetry is not the norm in the mustard family, Brassicaceae (Brassicales, Figure 1b), a CYC-like gene has been implicated in the evolutionary transition to floral zygomorphy in the candytuft (Iberis), which is closely related to Arabidopsis . The dorsal petals of Iberis amara are reduced in size relative to the ventral petals, and a CYC-like gene in I. amara is specifically expressed in later stages of dorsal petal development as they differentiate in size from ventral petals. In I. amara peloric mutants (radially symmetric flowers), dorsal petals are similar in size to ventral petals and lack the wild-type pattern of dorsal-petal-specific CYC-like gene expression. In addition, heterologous functional studies in Arabidopsis demonstrate that I. amara CYC-like genes function to reduce petal growth, consistent with dorsal petal morphology in I. amara . Beyond a role for establishing corolla zygomorphy in multiple eudicot lineages, changes in the expression of CYC-like genes are correlated with stamen number evolution. CYC expression during snapdragon flower develop ment is necessary for dorsal stamen abortion  (Figure 1a). In the close relative of snapdragon, the desert ghost flower (Mohavea confertiflora, Plantaginaceae), increased number of sterile staminodes (dorsal plus lateral) correlates with lateral expansion of the domain of CYC-like gene expression into lateral stamen primordia (reviewed in ; Figure 1a). These studies of corolla symmetry and stamen number evolution both illustrate that the function of CYC-like genes in core eudicots is generally related to the control of dorsal and lateral floral organs, with a possible exception in Asteraceae , leaving open the question of whether CYC-like genes might just as easily be co-opted to pattern ventral flower morphology. Recently, two studies explicitly addressed the question of whether changes in regulation of CYC-like genes might explain evolutionary novelty in ventral flower morphology, specifically abortion of ventral stamens. Preston and Hileman  found no evidence that shifts in the expression of CYC-like genes correlate with ventral stamen abortion in Veronica and Gratiola (Plantaginaceae, Figure 1a). On the other hand, Song et al. provide the first evidence for a function of CYC-like genes in the abortion of ventral stamens. This ventral activity is associated with a new expression domain in ventral stamen primordia of Opithandra (Gesneriaceae, Figure 1a). By evolving a new domain of expression this CYC-like gene has acquired not a novel role but the ability to carry out the same role in a new position. The evidence that CYC-like genes have been recruited multiple times in the evolution of floral zygomorphy, along with these exciting new data from Opithandra , open up the possibility that CYC-like genes may have a role in the evolution of diverse patterns of stamen abortion. These recent data suggest that CYC-dependent floral modifications may evolve without restriction to dorsal/lateral positioning - and this might even extend to a role for CYC-like genes in the development of unisexual flowers. Indeed, there is a strong correlation between CYC-like gene expression and stamen loss in maize female flowers . The fact that CYC-like genes have been recruited for the evolution of ventral stamen abortion in the lineage leading to Opithandra, but not in the lineages leading to Veronica or Gratiola, suggests that as additional, independently derived reductions in stamen number are explored, convergent genetic mechanisms affecting cell proliferation are likely to be identified. This stands in contrast to the growing body of evidence that transitions to floral zygomorphy recurrently involve the recruitment of a CYC-dependent developmental pathway. The recent studies discussed above illustrate how TCP genes, in particular class II TCP genes, have greatly contributed to the evolution of novel morphological traits and the modification of existing ones. This may be due to their great capability to alter the growth patterns of tissues in which they are expressed (reviewed in ). Extensive duplication and diversification during plant evolution may have facilitated their co-option multiple times in morphological transitions. It is now understood that groups of class II TCP genes are transiently expressed in different developing tissues, such as flower and shoot meristems and leaf and floral organ primordia, where they help give shape to these structures. Indeed, these genes not only control floral organ number, petal shape and stamen abortion (CYC-like genes) but they also have strong effects in leaf shape, size and curvature (CINCINNATA genes) and prevent branch outgrowth (TB1/BRANCHED1 genes; reviewed in ). Given that they control basic developmental processes related to tissue proliferation and differentiation, it is perhaps not surprising that TCP genes have been recruited many times independently in the evolution of plant developmental patterning. The field is now open for exploring how evolutionary changes in this critical gene family have affected other diverse aspects of plant form. LCH's work is supported by NSF grant IOS-0616025. PC's work is supported by Spanish MICINN grants GEN2006-27788-E, BIO2008-00581 and CSD2007-00057.